McDonald’s has started serving its All Day Breakfast menu on October 6. But the extended breakfast menu offers a limited selection and varies by location. 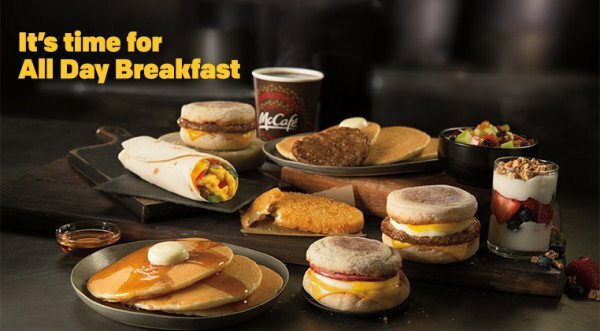 Just half of McDonald’s 24 total breakfast items are available as part of the full-day menu. Several items like the Egg White Delight McMuffin or the McGriddles did not make the cut. However, it mentions that “Menu items vary by location”. The new All Day Breakfast menu includes: Egg McMuffin, Sausage McMuffin, Sausage McMuffin with Egg, Bacon Egg&Cheese Biscuit, Sausage Biscuit, Sausage Biscuit with Egg, Hotcakes, Hotcakes and Sausage, Fruit ‘N Yogurt Parfait, Sausage Burrito, Fruit & Maple Oatmeal, Hash Browns. On social media, some Twitter users expressed disappointment about the limited menu. About 20% of markets, which are mostly in the Southeast, will serve biscuits all day while about 80% of markets will serve McMuffins. This means if you’re a biscuit lover on the West Coast with a hankering for a bacon egg and cheese biscuit for dinner, you’re likely out of luck. Hash browns also won’t be available everywhere though, spokeswoman Lisa McComb notes the “vast majority” or about 90% will have them.